Tickets Now On Sale - see you & your friends there! THIS EVENT IS SOLD OUT!!! - TICKETS WILL NOT BE AVAILABLE AT THE DOOR!!! See you next time!!! Be sure to "Like" & "Share" above to help spread the word!! Includes Entry to the Philadelphia Pizza Festival and Free Parking! Note: This ticket does not include a Phillies game ticket. Includes Entry to the Philadelphia Pizza Festival, Five Festival Slices, One Phillies Game Ticket, Access to Walk the Warning Track & Dugouts, and Free Parking! Ticket sales ended at: 9/8/2018 at 6:00 PM $24.95 Ended 2! Includes Admission for one, 1-Hour Early Entry at 12PM, Exclusive Indoor VIP Area inside the Hall of Fame Club with a Craft Beer & Wine Sampling, VIP Restrooms, 10 Festival Slices, Commemorative Gift Bag, Two Phillies Game Tickets, Access to Walk the Warning Track & Dugouts (weather permitting), and Free Parking! WOW IS RIGHT! Pizza lovers rejoice! 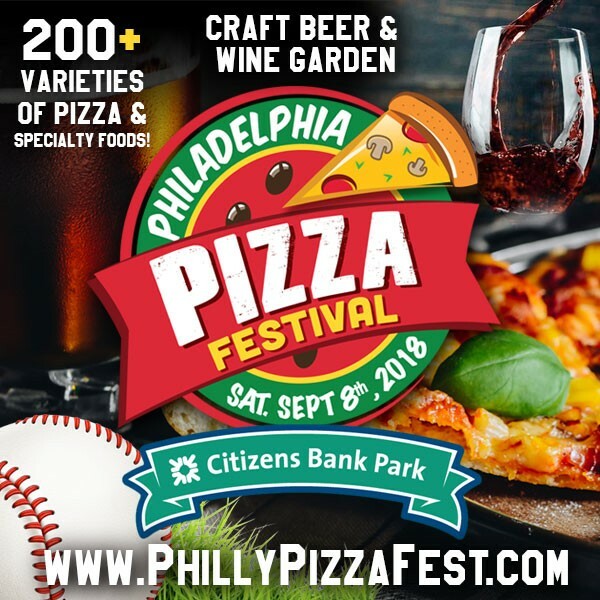 Philadelphia's Pizza Festival is taking place at the action packed Citizens Bank Park on Saturday, September 8, 2018! Join us for a day filled with tons of delicious pizza varieties, specialty drinks, a giant craft beer & wine garden, live entertainment, 2 kid's play areas and lots of pizza themed activities! Come with an appetite and prepare for mouth watering bites and tasty sips you'll be savoring for a long time to come! - Exclusive VIP Area inside the Hall of Fame Club!!! - Yes, your kids are allowed into the VIP area with you! - Yes, you read that right. Each ticket comes with 1 or 2 Phillies game tickets, which you will receive upon entrance to the event. These are good for select games in the 2018 and beginning of the 2019 season (each ticket is a $38 value!!) PLUS, you and your family and friends will have a once-in-a-lifetime chance to experience Citizens Bank Park like never before by walking around the entire warning track and the infield bases! (subject to weather conditions) WOW IS RIGHT!!! - Children 8 & under are FREE & do not need a ticket. View More Events Organized by Philadelphia Pizza Festival. Welcome to Pizza Heaven at the Philadelphia Pizza Fest! This event is organized by Philadelphia Pizza Festival.